While Oppo’s line of flagship handsets has been relatively safe in its designs, its mid-range and premium offerings are both arriving with some seriously novel design features. 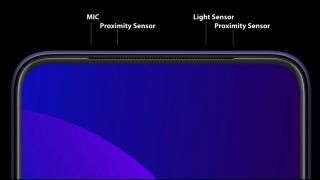 The Oppo F11 Pro has officially been announced, showing off, rather prominently, the lack of a notch and pop-up selfie camera that enables this uninterrupted screen. While there is a thin chin bezel, this mid-range handset has very little surrounding its screen on the top and sides. Thanks to the removal of the notch, the F11 Pro has a screen-to-body ratio of 90.9%, letting the 6.5-inch, 1,080 x 2,340 display take center stage. The slim bezel on the top of the handset is home to a microphone, light sensor and two proximity sensors. The pop-up camera is rated to last extensive use, and is able to survive being opened and closed 100 times a day for six years. This tidy face means that the rear of the device sports a fingerprint scanner alongside an impressive 48-megapixel dual-lens camera. This snapper apparently has improved night shooting capabilities due to its sensor with a larger 1/2.25-inch photosensitive area. 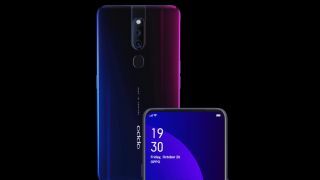 Some other impressive features for the handset are its 4,000mAh battery, which should provide a battery life of 15.5 hours with typical use cases, and Oppo’s proprietary VOOC flash charging 3.0 will top it back up quickly. It seems that Oppo has taken note of the criticisms of its premium Find X handset, which featured an entire shelf that slid up for taking both forward- and backward-facing photos, and opted to minimize the size of the mechanically moving part. 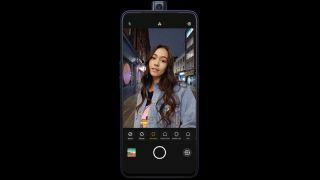 It’s worth noting that Oppo is the sister company of OnePlus, sharing the same supply chain, and the recently leaked OnePlus 7 could well be sporting much the same pop-up camera design and tech that we see here on the F11 Pro. At present, the F11 Pro is available in India from Rs. 24,990 (about $350 / £270 / AUD$500) for the 6GB RAM / 64GB storage model in either Thunder Black or Aurora Green. 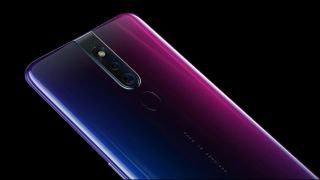 Officially, there’s no word on whether it will release in other regions, but we can likely expect it to land in Australia and the UK at a later date given Oppo’s previous releases.